This blog's about vegetables, right? So you think a mere cookie rates an exception? No way! Just like Day 199's Secret-Ingredient Chocolate Cake, today's cookies are moistened by a root vegetable. This one is orange. This one is ... sweet potato! I experimented with a real short-cut for the sweet potato: baby food. In fact, the baby food puree had lots more flavor than the sweet potatoes cooked a couple of days ago for Sweet Potato Puff and Sweet Potato Biscuits. This is A Veggie Venture's official entry in the online Cookie Swap going on over at Domestic Goddess through November 27th. There's still time for YOU to bake! That said, as good as they are, these cookies wouldn't work for a cookie swap: too messy to package up and carry home. December 1 Update: Move over Martha Stewart -- all around the world, food bloggers have been baking with pounds of butters and kilos of flour and they're all summarized here. Cream the butter and sugar in a large bowl with an electric mixer until very soft and creamy. Add the egg and beat well. Add the sweet potato, vanilla, zest and combine well. ::: Warning: unorthodox time- and dish-saving tip follows ::: Before measuring, stir the flours with a spoon right in the canister. The 'lightening' effect will be palpable and reduces the weight of the flour by as much as 25%. Doing this makes all baked goods lighter and less floury. Now measure the flours, baking powder, baking soda and salt on top of the wet mixture but without incorporating it in. With a fork, stir them together lightly, still without incorporating them in. This replaces the sifting that recipes usually call for to lighten the flour. ::: Now incorporate the dry ingredients into the wet until just mixed, then gently stir in the pecans. With two spoons, one to scoop and one to scrape, spoon about a tablespoon of dough onto a cookie sheet and bake for 12 minutes or until golden. Meanwhile, mix the glaze ingredients. Spoon a spoonful over the warm cookies, then press a piece of pecan into the glaze. Around the Southern Table by Sarah Belk, a "new" favorite cookbook, that is, one long relegated to the bookshelf but now getting much-deserved attention! Alanna, I bet these are just great. 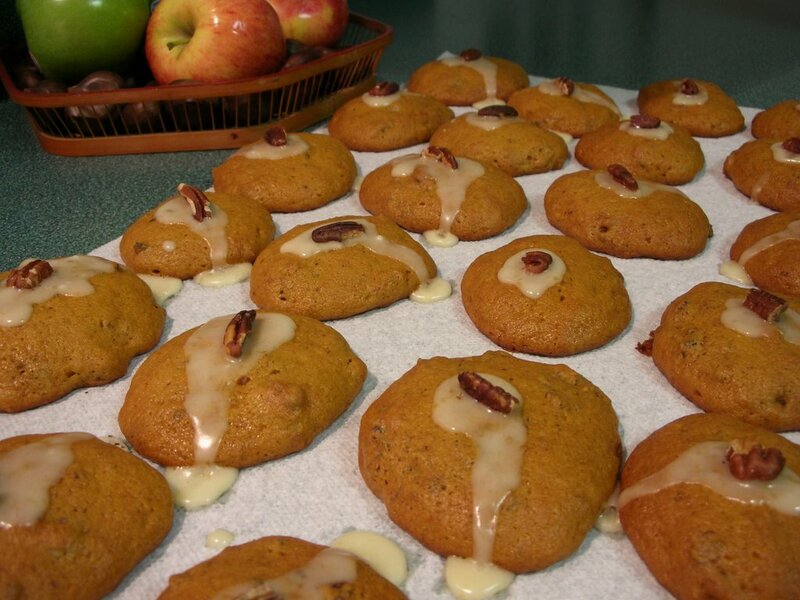 Kind of like a pumpkin cookie! Very nice choice. I love the idea of these cookies! Sweet potato packs in such a nutritive punch, and the baby food is a great idea. Dear Alanna - it looks just yummy! What a wonderful treat! Thank you for the recipe details. Our My Dhaba's rock cookies are yet to be released from Il Forno. Hope you like those simple ones. Hi Alanna--I LOVE this idea, and I love the way you inspire me into trying more veggies...THANKS! !